If you are a parent with a sick child we want to hear from you. Please tell us your story on our Facebook Page! 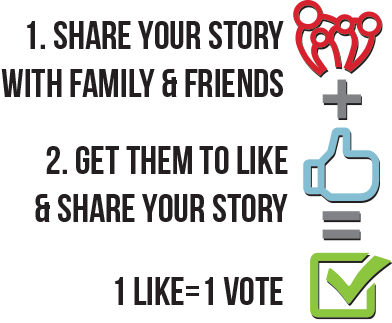 Share your story, get your friends and family to like and share our page and vote for you! Encourage others from the Facebook community to read all the stories posted on our page and vote. We need your help to share this page! If you know someone that could use the Collishaw Care-A-Van, and has a sick child, now is your chance to help them by sharing and liking this page be sure to tell them about the Collishaw Care-A-Van.